"A delicious sweet soup. Perfect for those days when a little cup of cocoa is just not enough." In a soup bowl mix the cocoa, sugar, vanilla, cinnamon and the reserved milk and cream. 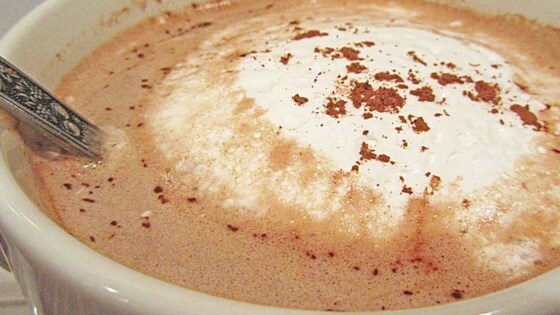 Pour the cocoa mixture into the hot milk and cream blending well. Return mixture to bowl and garnish with mini marshmallows or graham cracker bears. Hot cocoa doesn't make enough this hits the spot. More of a very rich drink than a soup. I would cut down significantly on the cream to reduce the fat and increase the flavor. It tasted like a regular cup of cocoa, except a bit richer because of the cream. The flavour wasn't as nice as I'd liked. It was okay. This stuff is delicious! You can microwave the milk if you are in a hurry. The recipe confused me a little bit. So the soucp became pudding. It was ok. A little thick, I would rather just make up some hot chocolate from a mix.